Vitaly S, Oggy B, Chico G, Mabi. Vitaly S Alexius, Kaitlin Gossett. Genre: Animated Webcomic, Print Comic. Post-apocalyptic, grimdark comedy, surreal. Adult (seriously). 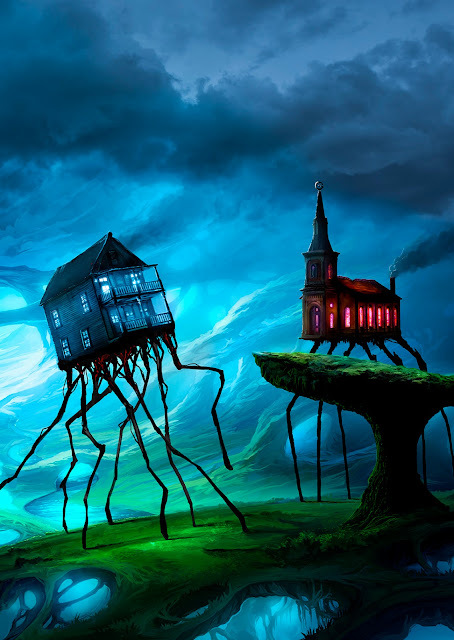 Neuro-atypical thought and psychosis plotlines. 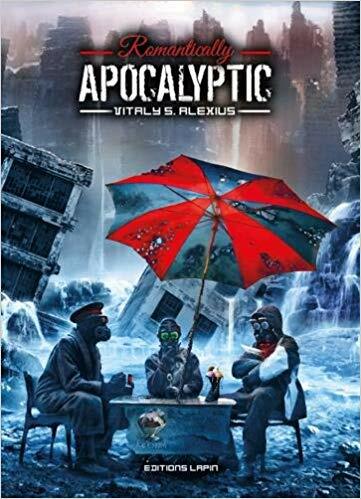 Romantically Apocalyptic can be read at this link and purchased at this one. A Topsy Turvy Tour De Force. To begin with, this webcomic is gorgeous. With its grasp of artistic conventions and its offbeat sense of humor, RA takes you through a cracked looking glass and into some of your weirder dreams. In this version of the future, tech advanced and human nature did not. Eventually, the inevitable occured: our species decimated itself and the planet. Now the handful of survivors scrounge in the rubble, fight creatures mutated to survive so much better than they can in the wastes, use the bits of tech they’re left to scrape a living and dream of other things. But you don’t have to look so glum about it! The characterization is a fascinating and fun exploration of altered states of consciousness and mental process. If Mad Max had sung kids’ songs or if Bruce Willis had been on bad Prozac while creating his dire futuristic movies, they would have been a bit like RA. It’s a trippy ride through the comforts of delusional thought, gallows humor and friendship in the grimmest of grimdark situations. The Captain and Pilot have gone so far down into their own dreams that reality can no longer do them any harm. They set up Christmas parties with skeletons and hold conversations with billboards. To keep the readers in their mindset, the realistic art is regularly broken up with chibi scribbles. Funnily enough, in their situation this kind of dissociation isn’t a terrible idea. If they didn’t reinvent the world into something they enjoy living in, they probably wouldn’t survive long. Unfortunately for their ‘friend’ Charles Snippy, he’s still sane. He’s relying on sheer stubbornness and weary survival instinct. And he’s getting really sick of these nutcases. The contrast between Snippy’s dogged and nihilistic sanity and the rosy madness of his companions is disturbing, intriguing, and downright laugh-out-loud funny. Surreal, silly and terrifying by turns, this is a story worth following. Er…correction. This is a story worth following when you can. While I enjoy the explorations of altered states of consciousness, at times the story wanders so far into the surreal that it becomes incoherent as a narrative. Using Snippy as an access character does help, balancing the madness with a dose of hard-headed if depressing reality. But we as readers end up as bewildered as the character fairly often, trying to ask the world we find ourself in what gives. This can be interesting, but eventually it gets exhausting. That’s the problem with experimental writing: some experiments blow up. The writing has good times and bad times. When it’s written as a comic, the story is witty, spot on and clever. But then it tries its hand at prose and everything goes downhill. The primarily textual sections read at times like a narrative and at times like pages from a psych patient’s diary. That exploratory style is interesting for a paragraph, maybe, but it palls very quickly. As a reader I found myself scrolling past these sections, not invested enough to parse them for meaning.Thankfully, each time I felt myself losing interest there would be a picture that drew me back into the flow. Frankly, if you follow my lead and scroll past them you won’t miss anything. But hey, if mad rambles and mystery are your thing, you may love these passages. Get some shots or a bowl and give Romantically Apocalyptic a read. Start with the shiny and animated webcomic for best effect. You’ll be glad you did.